The communication link between the Rosetta spacecraft and the Philae lander was turned off on Wednesday, marking a bittersweet milestone in the final days of the mission to Comet 67P/Churyumov-Gerasimenko. 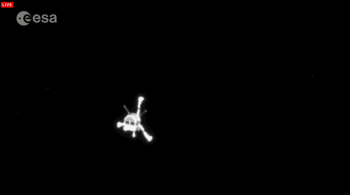 Although there hasn’t been any communication from Philae for a year, Wednesday’s event officially closed the chapter on a mission that will conclude with Rosetta crashing into the comet. The ambitious mission involved ten years of transit since the Rosetta/Philae launch in 2004, culminating in the first-ever soft landing on a comet. 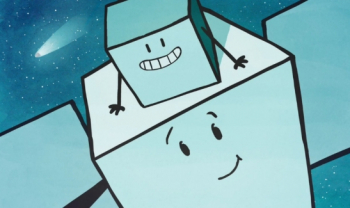 It will end when Rosetta crashes into the comet at the end of September to conclude a hugely successful mission that captured the imagination of an adoring public, thanks in part to a superb outreach campaign via internet cartoons and social media interaction. There were a number of technical issues along the way, which did not come as a major surprise, given the complex nature of the mission. However, none proved to be insurmountable per the mission goals. The mission will go down in history as a huge success. Notably, Philae’s stunning departure from Rosetta did go to plan, with stunning views of the spacecraft making its descent towards the comet. The problems that impacted on the rest of the mission involved the cold gas thruster system that was to aid the lander’s touchdown, along with the issue of the harpoons failing to fire to hold Philae in place. As such, the spacecraft was unable to remain in the designated landing area. 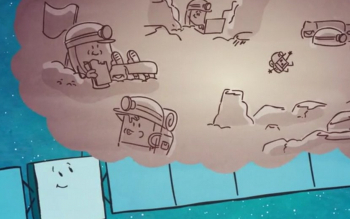 It was then revealed that Philae’s location was not ideal for its solar arrays, required to gain power from the Sun. 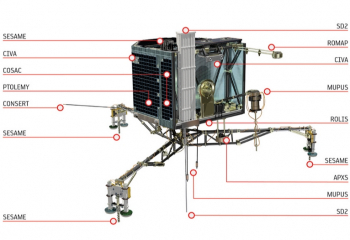 The lander was shadowed by a cliff, a major issue – not helped by the fact the lander was not in its correct orientation, hindering the power collection of the arrays that are located around its body. After a large amount of ingenuity from the Rosetta and Philae teams, a final science drive was conducted with the remaining battery power, prior to communications being re-established for the key transmission of data from Philae’s work on the comet. 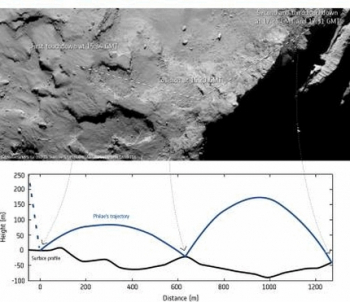 Soon it was shown Philae was fighting against fading battery power, as expected. However, the intrepid lander showed true fighting spirit and kept firing data at Rosetta, ahead of it being transmitted back to Earth. Although the mission was already classed as an incredible success, there was a small amount of hope the lander could get lucky if sufficient sunlight falls on the solar panels to generate enough power to wake it up. The small possibility of Philae returning to life would come as the heavenly body moved farther into the inner reaches of our Solar System, potentially allowing sunlight to recharge the lander’s arrays. 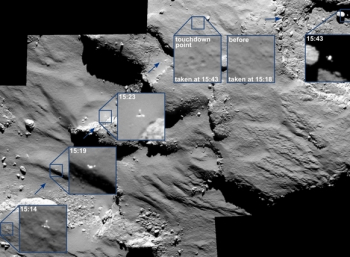 With Rosetta still in orbit, searches continued to find the lander on the surface. The likely area was known, but no confirmed visual sightings had been made during the passes. 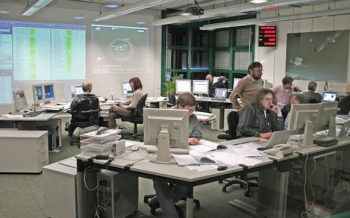 The official announcement soon followed, confirming signals had been received at ESA’s European Space Operations Centre in Darmstadt. ESA noted that more than 300 data packets were analysed by the teams at the Lander Control Center at the German Aerospace Center (DLR), as the lander finally managed to make contact and confirmed it was back in business. As the comet continued its path towards the sun, it was hoped Philae would be able to gain the required power to continue operations for some time. However, the lander was soon to fall silent, communicating one final time just a month later, last July. With hope fading for any return of communications, a decision was to be made on officially cutting the link. That resulted in Wednesday’s decision to shutdown the Electrical Support System Processor Unit (ESS) on Rosetta. The decision – carried out at 10am UTC on Wednesday by Rosetta Mission Operations Centre, in coordination with the DLR Lander Control Center and the Rosetta Science Ground Segment – was for the sake of Rosetta, as the spacecraft is over 500 million km from the Sun, and will start facing a significant loss of power – about 4W per day. Rosetta’s days are numbered, with a controlled impact on Comet 67P/Churyumov-Gerasimenko to occur on 30 September 2016, ending the mission. The spacecraft will target Ma’at, a region hosting some active pits on the small comet lobe. This region has been chosen for its scientific potential and taking into account key operational constraints involved in executing the descent. 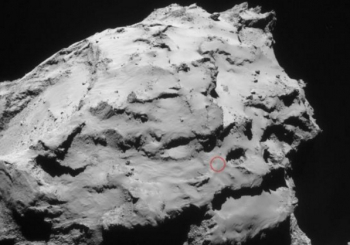 The expected time for Rosetta’s contact with the surface of the comet is approximately 12:30 CEST / 10:30 UTC.